Nazism is on the rise across the globe, according to international and U.S. lawmakers who gathered on Capitol Hill Tuesday for a conference aimed at combatting the Nazi threat. After Adolf Hitler’s Germany fell to allied forces in 1945, "it was hoped that never again would we face ideology actions and policies that reflected Nazi ideas," Richard Brodsky, a former New York state lawmaker and scholar, told a crowd of concerned citizens from across the globe who had assembled at the Rayburn House Office Building. "There is clear evidence that the old ideology, the old tactics, the old hatred are being revived and the world must act and name it by its name and confront this awful reality," Brodsky said. Parliament members and activists from Latvia, Greece, Estonia, and Hungary, among other nations, took to the stage one by one to recall their firsthand experience with resurgent Nazi groups in their countries. The united under the banner of an organization called World Without Nazism. "I myself was attacked by 15 to 20 far right youngsters after a [neo-Nazi] demonstration" in Hungry, recalled Hanty Vilmosh, former President of Hungary’s International Federation of Resistance Fighters, which took on the Nazis during World War II. Vilmosh, who spoke through a translator, showed a video of neo-Nazi groups in Hungary rallying in the streets, desecrating Jewish memorial sites, and threatening immigrants. "The far right exists in many other countries but the government" typically tries to suppress them, Vilmosh said. "In Hungary that is not the case." "In 2013 Hungary is standing at the gate of Nazism," Vilmosh said, referring to Hungary’s Jobbik party, a far right political party that preaches violence against Jews and other minorities. Hungary is just one of several European countries to see fascism gain a renewed foothold among the public. "The revival and proliferation of Nazism in its traditional form is a clear and present danger in central and eastern Europe," said Joel Rubinfeld, co-chair of the European Jewish Parliament in Belgium. "It also exits in Western Europe," mainly in the proliferation of "radical Islam," Rubinfeld said, citing the 2012 killing of four at a Jewish day school in France and other similar recent incidents. The European lawmakers and activists said they came to D.C. in order to meet with U.S. lawmakers and administration officials about ways to comprehensively combat the emerging Nazi threat. They hope to develop legislation and materials to raise awareness to the issue and potentially outlaw some of the most violent and pernicious Nazi outfits. 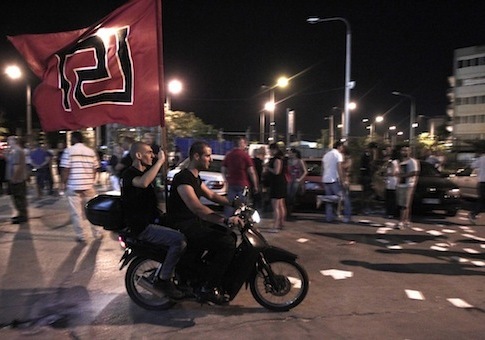 The rise of Greece’s Golden Dawn political party, a neo-Nazi party that has won many seats in parliament, is being viewed as a troubling development among Jews and minorities. Golden Dawn is attempting to exploit populist anger over Europe’s financial crisis and channel it towards Nazi ideology, officials explained. Greece is among a number of nations where Nazi political parties have gained mainstream traction. "This is an extremely important problem" in Asia, Africa, South America, and even America, where a New Jersey man recently showed up to court sporting Nazi regalia, according to Alexander Pochinok, a former Russian lawmaker and minister. Preliminary statistical analysis across the globe show that Nazi ideologies are becoming more popular, Pochinok said, describing the findings as "a serious and very dangerous trend." Politicians in countries such as Moldova and Greece, as well as the Baltic states, are "playing [up] Nazi ideology or fascist ideology and everywhere we can see the activist of such politics and parties," Pochinok said. "In Russia it seems we are traditionally against Nazism, but we can see how some politicians are trying to play with the youth and create radical movements," he said, explaining that rising poverty levels fuel the nationalistic and fascist fervor. This entry was posted in National Security, Politics and tagged Greece, Media. Bookmark the permalink.